Rarely do we get something this fresh in a new FPS game. You’re just a hacker who wanted to play a game. You weren’t supposed to breach their system, and now you have to kill. Superhot is a product of the 2013 7DFPS game jam that tasked developers to conceive, design, and finish a working first-person shooter prototype in a mere seven days. The game is predicated on the idea that time only moves forward when you are in motion. It sounds like an evolution of the Matrix-style bullet time ability popularized by the third-person shooter Max Payne in 2001. Activating the ability slowed down the passage of time and allowed the player to dive out of cover and make precision shots while virtually hanging in mid-air. The bullet time ability in Max Payne could only be activated in short bursts before having to recharge, however, so quick thinking and fast reflexes were still the keys to beating the game. Superhot on the other hand has a bullet time effect in perpetuity. Objects move at a crawl when the player isn’t in motion, but the passage of time is still effectively under the player’s control. This eliminates snap judgments and reflexes from the equation. Superhot may very well belong in the same set as System Shock and Half-Life, first-person shooters that demonstrated a substantively different approach to the genre. Years of experience playing first-person shooters (FPS) certainly comes in handy when playing Superhot, but instincts informed by years of FPS gaming can also get you killed. Someone who’s never played a first-person shooter in their lives could probably learn how to play Superhot just as well as any genre veteran. Superhot is accessible, which is not something you can say about most FPS games. Superhot takes place in a retro-cyberpunk future where virtual reality software runs on operating systems that feel like DOS. In a series of chat exchanges that mimic Neo’s opening scenes in The Matrix, a friend offers you a copy of superhot.exe, a software crack for a crazy new game. Video game piracy is still a thing that companies take seriously in the future world of Superhot, only the consequences can be much worse than criminal fines and jail time. If you’re illegally jacking VR software into your head, you never know precisely what you might be getting into. The story in Superhot is the most derivative part of the package, but it pulls off some shockingly excellent fourth-wall-breaking turns that extend the experience beyond the game itself. I didn’t expected and was pleasantly surprised that I have to worry about story-related spoilers at all with this game. Strictly speaking Superhot is a first-person shooter, but slapping that label on the game almost feels like selling it short. Superhot is equal parts chess game, ballet, and ruthless aggression. Most of the levels take place in very tight spaces where the enemy is upon you almost immediately. You can begin a level of Superhot locked in an elevator with three gunmen, one with his gun already raised and ready, or locked in a cage with four men at arm’s length, some of whom are carrying baseball bats. Looking around to get your bearings will get you killed if you misjudge the distance between you and an oncoming bullet, because looking around takes time. Jumping is a single uninterrupted motion, i.e. you commit to all the frames of a jump when you hit the jump button. You’d better make sure you know where enemies and bullets will be throughout that progression before you make the choice. Three melee hits in a row will kill someone. Throwing a punch also means committing to several frames of animation, however, so the bullet you thought you could still avoid might be right on top of you when the punch animation is finished. Then you’re dead. Picking up objects presents the same issue. Every frame of movement in Superhot needs to be accounted for. Using cover isn’t always to your advantage. With time slowed down, aural cues like hearing from which side shots are being fired ceases to assist you. You may hear someone fire shots from around the right side of a pillar you’re hiding behind, but where are the bullets? Will they be right on top of you when you peek around the corner to see where the shooter is standing? Remaining out in the open and dancing between bullets is often the best tactic. There’s no reloading in Superhot. When your gun is out of ammo, you’ll be given a quick text prompt across the entire screen to let you know. Sometimes there are guns lying on nearby surfaces, and once in a while there will be a gun rack on the wall, but the vast majority of the time your only option when you’re bingo on rounds is to relieve someone else of their firearm. There are almost always objects lying around like liquor bottles or ashtrays that you can pick up and throw at people to stun them. If they are holding an object at the time, it will fly out of their hands and into the air where you can grab it. Your best bet will often be to throw your empty gun at your target. Bullets in Superhot break everything that can be picked up, however. If someone fires a shotgun at you and you throw an empty weapon into the cloud of shells, the gun will break before it strikes the gunman, so you can’t just haphazardly throw empty guns at people and hope for the best. Throwing objects is a tactic that requires planning ahead, just like everything else. There are no “correct” solutions to each level of Superhot. You are given a steady buildup of possible techniques and experience that give late-game levels a sandbox quality. Superhot never explicitly teaches you this, but in moments of desperation you can punch and destroy bullets. You will probably have to slow time down to a crawl to time this correctly. Katana blades can also be used to slash bullets apart, and they make for thrown weapons that can kill, not merely stun. Late in the game you are given the Hot Switch skill that allows you to jump into the body of another person, and in the process destroy the previous body you occupied. At first Hot Switch may feel like an overpowered option. Then you jump into a new body without realizing that another gunman is directly behind the body that you jumped into, which equates to a death sentence. You will pull off complex sets of maneuvers that make you feel like a badass, but it isn’t until the level is completed, when you get to see a full-motion replay of what you did, that you’ll realize a really good run at a Superhot level makes Neo look like a noob. Where Superhot is just like any other FPS game is the degree to which learning the levels is important. Your first run at a new level might be very exciting but after two or three deaths you know where everyone is, and then you aren’t improvising as much as playing to the level. Superhot’s story takes place over 26 levels, and a successful run at many of them may last no more than a minute or two. You might be able to finish the story inside of three or four hours, after which you unlock a selection of challenge modes like katana-only levels, only having one bullet per gun, shorter stun times when you punch enemies, or faster bullets. When the story is finished you also unlock Endless mode, which places you in small arena and features variants based on real-time challenges, like getting 30 kills as fast as possible or seeing how many kills you can rack up in 60 seconds. Even with the bonus modes Superhot is a short game. Once you’ve learned all the different moves and have your timing down, post-story Superhot feels a little like improvisational dancing. There’s variety, but you’re aware of your limited repertoire and want to learn something new. 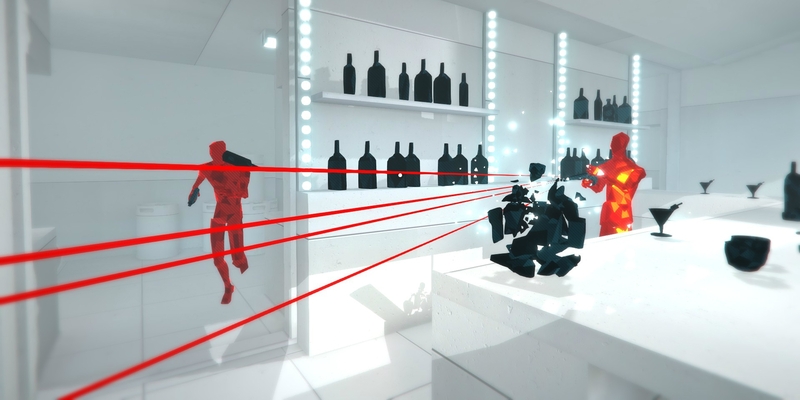 Superhot still feels a bit like a proof-of-concept extension of the 7DFPS prototype from 2013, an example of how fantastic a first-person shooter can be if you build it around a permanent bullet time mechanic. I hope Piotr Kosmala and his development team release some DLC for Superhot and eventually expand the concept into a much larger game. Game jams represent the best of what the indie development world has to offer. They’re a source of unfettered creativity where developers try to focus on interesting ideas more than whether a game might sell. Every so often a game jam produces something special that is both interesting and commercially viable. A game like Superhot. Disclosure: Our Steam review copy of Superhot was provided courtesy of SUPERHOT team. Dennis Scimeca was the Daily Dot's gaming reporter until 2016. He loves first-person shooters, role-playing games, and massively multiplayer online games. His work has appeared in Salon, NPR, Ars Technica, Kotaku, Polygon, Gamasutra, GamesBeat, Paste, and Mic.